An early flight from Edinburgh meant that we had to stay at the Airport Hotel the night before flying out. 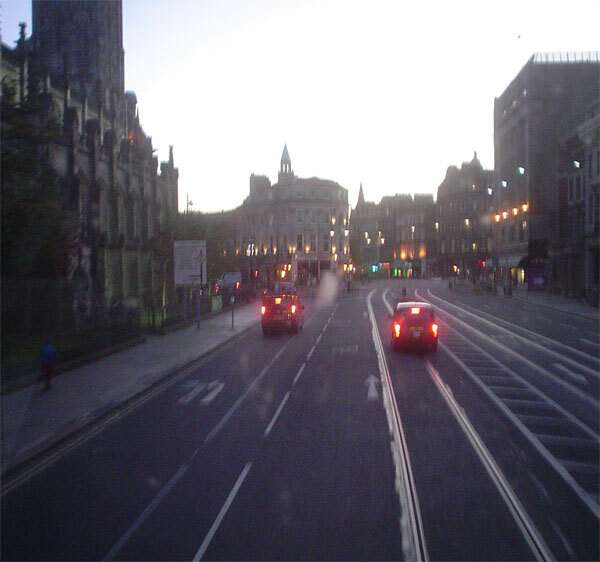 I was excited to see the old city again and it was a lovely evening to take the bus into Princes Street and walk around. 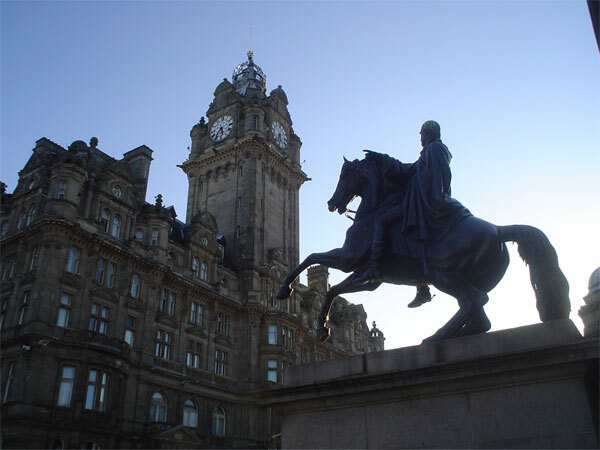 This bronze statue of the Duke of Wellington stands outside Register House at the end of Princes Street. Right across the road is the Balmoral Hotel. In my day this was the North British Hotel, a traditional railway hotel, adjacent to Waverley Station. The clock tower is an Edinburgh landmark, always set two minutes fast to ensure people don’t miss their trains. 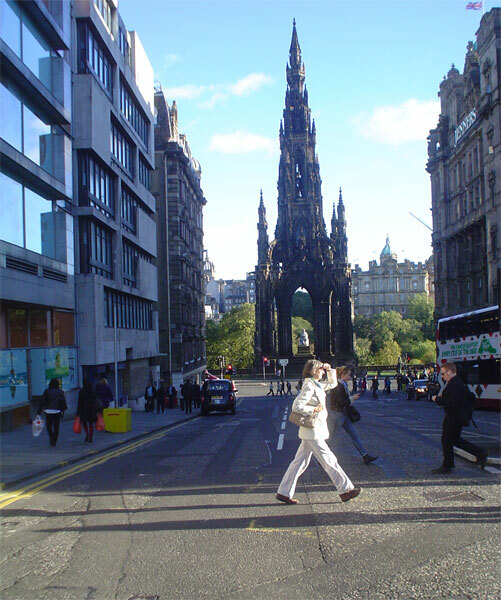 The Scott Monument, commemorating Sir Walter Scott, is the largest monument to a writer in the world. The exterior is decorated with carvings of characters from his novels; inside you can see an exhibition on Scott’s life, and climb the 287 steps to the top for a superb view of the city. 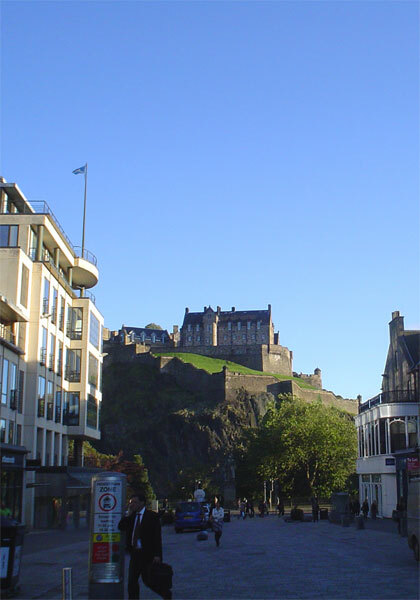 Of course the most famous building is Edinburgh Castle perched on an extinct volcano. The castle rock has been inhabited from around 900 BC, but it wasn’t until about 1140 that the first stone Castle was build by Malcolm III. It was strange seeing these ancient buildings again. For almost 60 years I saw them during visits to Edinburgh, appreciating them, but never really considering how old they were. Canadian history is very young. It wasn’t until the early 1600’s that the first French colonists set up a settlement at Port Royal, now Annapolis Royal here in Nova Scotia and 1749, before Halifax was founded. 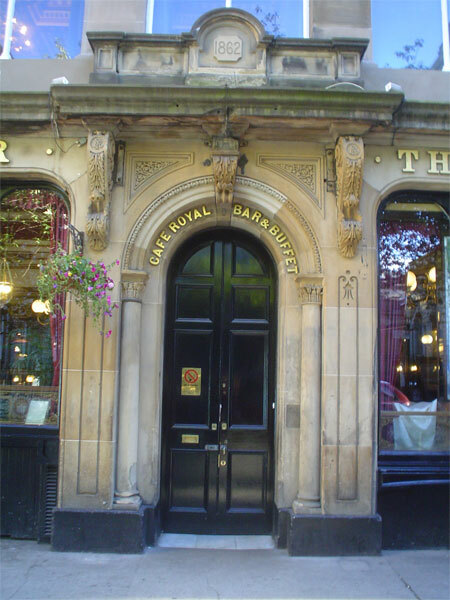 One of the first places Jeff ever took me to for a meal was the Cafe Royal. This building has been here since 1862 and has stained glass, murals, mirrors and wood panelling. Imagine our disappointment to find that it was closed for 3 days! There is no dearth of eating establishments on Rose Street, so we set of to find one. 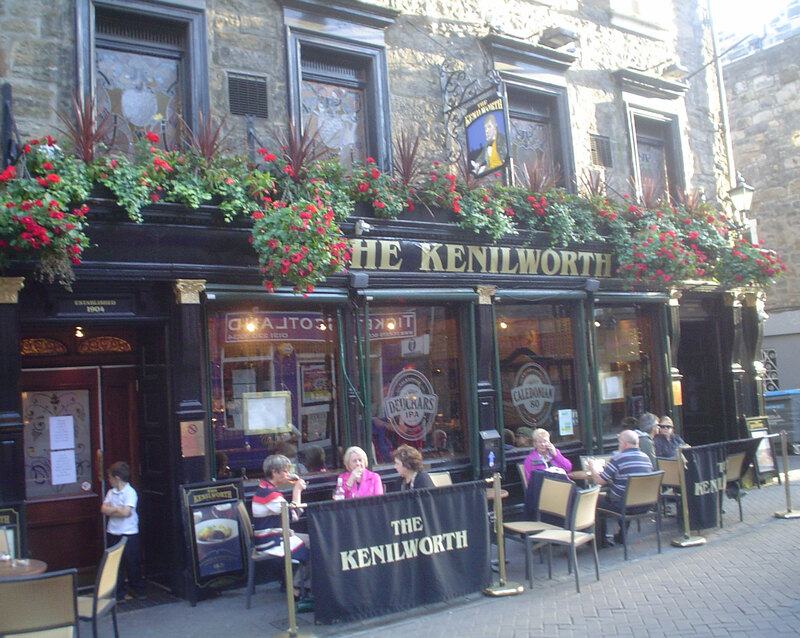 The Kenilworth looked popular, but it wasn’t until I looked at this photo that I saw how young the clientele were. 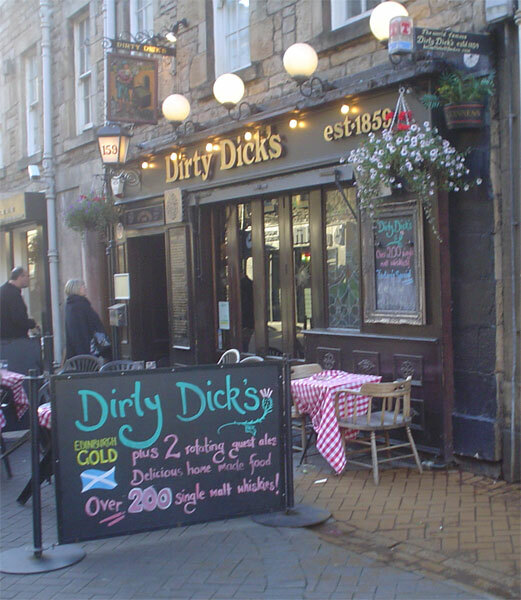 I didn’t think I could eat in a pub with this name. We eventually chose the Abbotsford Bar and Restaurant and enjoyed a wonderful meal of venison. It might be a long time until wget a chance to taste it again. This is a library picture, as I didn’t take a photo myself. I was surprised to see this Tardis in Rose Street. These were a common sight in cities in my childhood, but I couldn’t really remember what they were for. Jeff enlightened me. Seemingly, they were a telephone box for use by officers and the public, giving a direct telephone link to the local police station. The box was also used as a temporary police station and was even used to detain prisoners until a vehicle came to take them to the cells. 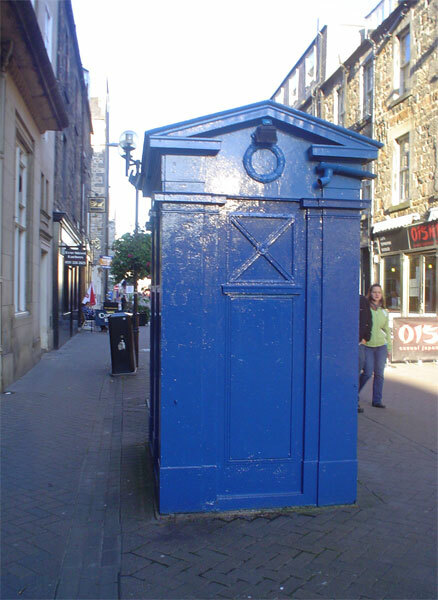 With the advent of telephone boxes in the 50’s and 60’s these police boxes became obsolete. It was getting dark as we headed back along Princes Street to our hotel. It had been a fleeting trip to Edinburgh, but quite long enough for us, now that we are used to the Nova Scotian pace of life. Ahh what I wouldn’t give for a trip in that TARDIS ! I’m not to sure about that! I’d want to know where I was headed first. Flying is ‘exciting’ enough for me. Thanks Heather, I see that the Police Box/Coffee Shop for sale, is actually in Edinburgh. I wonder if the one I photographed had been that too at some time. Are you back in England? Great weather here in canada since we came back. Hi Jackie, Yes, we’re back in the cotswolds now. The weather was fab in NS the whole time we were there, glad we missed the awful early part of summer! We’re having a heatwave here in southern England now, 3rd or 4th day in a row of over 25 degrees, really scorching and due to continue at least until Monday – can’t recall it so hot in the summer! I’ll be back in NS in early Nov, hopefully then we can meet up?! Thanks for sharing your wonderful photos from your Scotland trip – I hope you are enjoying our lovely weather – deapite the fact it’s raining today fall is our best season. Will go out tomorrow looking to make up a posy of rose hips and wild asters. I was enjoying the weather – until today. now Scotland seems to have our good weather.